Made with a soft leather upper and soft lining. Smooth upper with comes with a brown finish. Easy to put on due to easy pull loops either side of the rim. Slip-resistant PVC sole. Tough and durable suitable in all kinds of weather. Various sizes available. Smart court shoe ideal for office and formal wear, experience the style and comfort of this shoe made for the working woman. Extra wide fit for enhanced wearability. Amblers Berlin constructed with smooth leather upper and ultralight materials, affords an extreme feeling of comfort. Touch fastening strap forms a design on the shoe. PU Sole offers good level of grip. Crafted with a genuine leather upper and leather lining, these shoes have a slick upper and feature smooth lines with a smart front. 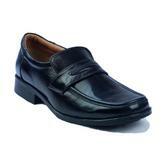 These are a smart dress shoe in formal loafer style. Amblers Manchester Leather Loafers are elegant and stylish. They feature a soft leather upper and leather sole. Incorporates a distinctive smart moc front design. Fabric lining for soft comfort against your feet it also features soft sock for added comfort. Open access for feet to slip on and off which makes these slippers very easy to use. A successful fusion of formal fashion with contemporary comfort. Amblers Liverpool men's shoes are practical enough for the workplace, yet stylish enough for special occasions. Featuring smooth leather outer and soft leather lining, these smart looking men's shoes combine style with comfort. Neat trims and pricked leather overlays bordered with stitching accents make these men's shoes a top style choice! An excellent shoe for formal events or everyday work wear! Crafted with taupe suede. Leather upper. Full lace up front with five perforations. Soft fabric lining. Comfortable smooth sole unit. 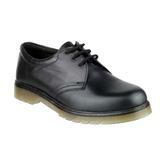 Amblers Ben Leather Soled Shoe is a gorgeously crafted shoe with genuine leather upper and lining. Handcrafted with genuine welt offering excellence and resilience. Features include leather sole with 1 1/4 inch heel, lace up front with five subtly perforated eyelets and heel stiffener support. This men's dress shoe is ideal for smart wear. This is a traditional leather Oxford men's shoe with classic leather sole. The handcrafted genuine welt stitched sole offers excellent quality and durability. The eyelets are delicately perforated at the lace-up front, and twin stitching accents border the neat leather overlays. 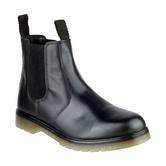 Manufactured from Leather making this a durable long lasting Dealer Boot. Front and Rear Pull-On tabs for easy use . Cold Insulated Non Safety wellington. Practical and lightweight PU boot reinforced in the critical areas for extra durability and impact protection. Amblers Liverpool men's shoes are practical enough for the workplace, yet stylish enough for special occasions. Featuring smooth leather outer and soft leather lining, these smart looking men's shoes combine style with comfort. Neat trims and pricked leather overlays bordered with stitching accents make these men's shoes a top style choice! An excellent shoe for formal events or everyday work wear! Smart casual pull on brogue dealer boot, with matte leather upper for a stylish look with a wing-tip trim. The textile lining and cushioned PVC sole provide all day comfort. Smart court shoe ideal for office and formal wear. Experience the style and comfort of this shoe made for the working woman. 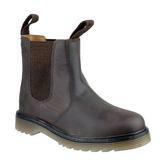 Occupational Chelsea boots, lightweight and flexible suitable for any low-risk applications. Full grain water resistant leather upper with Internal breathable waterproof membrane. High density PU midsole for excellent energy absorption. Amblers Carlisle Water-resistant Dealer Boots conform to Non-Safety EN ISO 20347:2012 OB WR SRC footwear standards. 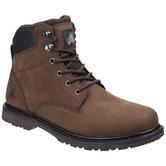 Occupational lace-up work boots, lightweight and flexible suitable for any low-risk applications. Fully waterproof allow the use in any weather conditions. 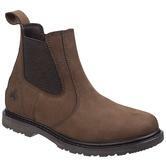 Amblers Millport Men Lace Up Boots conform to: EN ISO 20347:2012 OB WR SRA Non-Safety and Occupational footwear standards. 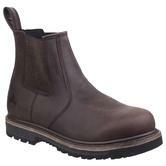 Full grain water resistant leather upper boots with Internal breathable waterproof membrane. Amblers Kennoway Non-Safety Dealer Boots conform to EN ISO 20347:2012 OB WR HRO SRC footwear standards. Injected PU welt and midsole for excellent energy absorption. 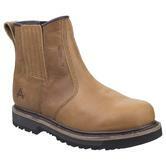 Amblers Aldingham Dealer Boots conform to: EN ISO 20347:2012 OB WR SRA Non-Safety footwear standards. 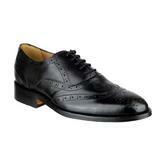 Unisex Gibson crafted with a smooth leather upper suitable for office-wear, schools and formal occasions. Leather Upper Full grain leather upper with a smooth finish. Lace-up front with three eyelets. Unisex Size Range Size range suitable for men, women and young adults. PVC sole resistant to 90°C, oil, acids and solvents (low concentrations). Offers comfort and durability and achieves SRA slip resistance rating. Cushioning technology that supports and flexes in key areas of your foot providing impact relief and superior comfort. The ergonomical support considerably reduces the effect of foot fatigue throughout the day. Specially designed lining wicks moisture away. Memory foam heel absorbs energy on impact. Anti-slip mesh lining reduces the risk of blistering from rubbing and slipping inside footwear. Built in antibacterial technology reduces odours and prevent bacterial and fungal growth. Built in 3mm pads offer impact relief and flexibility at the forefoot. Antistatic protection eliminates natural static charge. Suitable for any kind of work footwear. Amblers footwear is incredibly well priced: This range of Amblers non safety, executive work shoes is very popular. ranging from boots to ladies formal dress shoes, all crafted from the top quality materials. 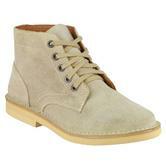 The shoes found in this category are suitable for all events Formal or Casual.